The Patriarchal Cathedral Basilica of Saint Mark or more commonly Saint Mark’s Basilica is located in Venice, Italy. It’s located in the Piazza San Marco at it’s eastern end next to the Doge’s Palace. It became the city’s cathedral in 1807 and is one of the best known examples of Italo-Byzantine architecture. This photo dates from 1964. A church was at this location as early as 832. It’s construction was ordered in 828 to house the relics of Mark the Evangelist that had been stolen from Alexandria by Venetian Merchants. That church building was burned to kill Pietro IV Candiano, the 20th Doge of Venice in 976 during a rebellion. It was rebuilt in 978. The existing church show in the picture was built on the same site about 1073. It was rebuilt and modified multiple times up until 1117. 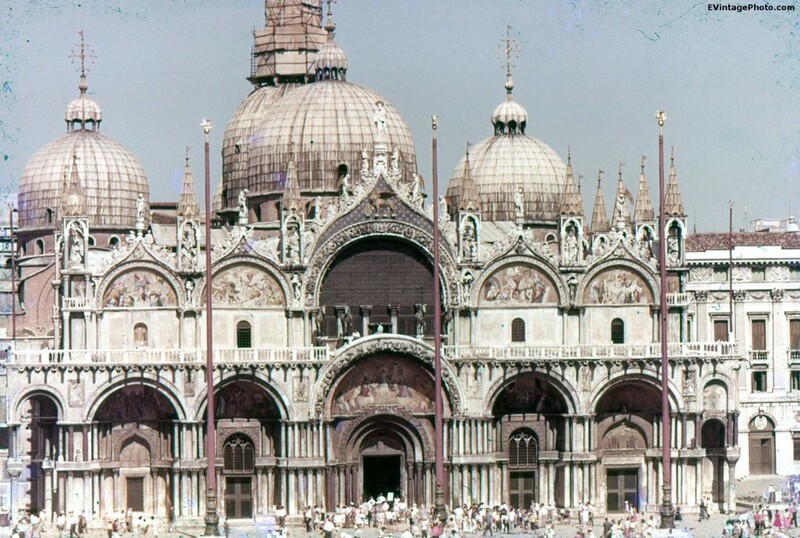 Saint Mark’s Basilica has seen more modifications over the centuries, mostly adornments added after successful Crusades, and marble covering the exterior brick work. The church seems to be a combination history and art museum due to it’s age and collections. Among it’s collection are a collection of Byzantine metalworking and stone carvings looted from Constantinople after the Fourth Crusades. The collection includes The Horses of Saint Mark, copper statues of two horses that at one time pulled a chariot. The statue dates to the 4th Century B.C. and are attributed to the Greek sculptor Lysippos. The originals are now stored inside to protect them from air pollution but have been replaced with full size bronze versions. Saint Mark’s Basilica is also known for it’s gold glass tesserae mosaics that cover the interior ceiling of the building. These were added in multiple stages, first as early as 1070, with the bulk of the work completed in 1270. Have you ever been to Saint Mark’s Basilica? If so, what is like to be in the middle of such history? Who was Saint Mark and why did the Merchants steal his relics?